Testing and specification of seismic and earthquake-engineering sensors and recorders has been marked by significant variations in procedures and selected parameters. These variations cause difficulty in comparing such specifications and test results. In July 1989, and again in May 2005, the U.S. Geological Survey hosted international public/private workshops with the goal of defining widely accepted guidelines for the testing of seismological inertial sensors, seismometers, and accelerometers. The Proceedings of the 2005 workshop have been published and include as appendix 6 the report of the 1989 workshop. 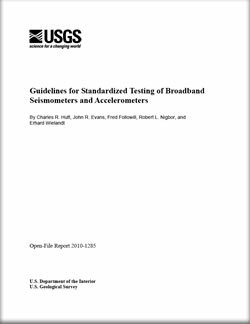 This document represents a collation and rationalization of a single set of formal guidelines for testing and specifying broadband seismometers and accelerometers. Hutt, Charles R., Evans, John R., Followill, Fred, Nigbor, Robert L., and Wielandt, Erhard, 2010, Guidelines for standardized testing of broadband seismometers and accelerometers: U.S. Geological Survey Open-File Report, 2009-1295, 62 p.